I’ve read about Kybella injections to get rid of a double chin. Do these injections work? Kybella is a non-surgical option to help rid patients of their double chins. This area under the chin is known as submental fat. Kybella is the first FDA approved injectable treatment to help patients improve their profile if they have moderate to severe fat below the chin. Kybella works by destroying the fat cells underneath your chin. Once these cells are destroyed they cannot store or accumulate fat again in that area. Kybella is a wonderful non-surgical cosmetic option for patients who do not wish to undergo surgery. However, there is nothing that delivers a better result than traditional submental liposuction (chin liposuction). Interestingly, after a series of 2 to 3 treatments of Kybella injections to rid your double chin, it is not inexpensive. Often, the cost of a series of Kybella treatments far exceeds the cost of surgically suctioning the fat from your chin area. My advice is two-fold: If you are bothered by the fullness in your chin, I would only recommend a non-surgical cosmetic treatment if the thought of surgery scares you. There is little to no downtime with recovery from these injections. 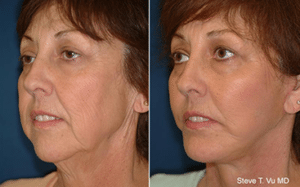 However, if you are looking at this as a cost savings alternative to traditional liposuction of the chin, then you will be disappointed (and so will your bank account). With any prospective patient, I always advise them to come in for a consultation so I can hear what is bothering you. I often encourage patients to bring in a picture or two of themselves to explain to me what it is they do not like. It is best to know where you’re coming from, so you know where you want to go with a procedure. I hope this answers some (or all) of your question about Kybella!